Chase down Killian with Iron Man and War Machine! Stop Killian from getting away with LEGO® Marvel Super Heroes Iron Man and War Machine! Blast the boat with the exploding buoy, fire the dual missiles and attack with War Machine's shoulder cannon! Includes 3 minifigures and a weapon: Aldrich Killian, Iron Man with Mark 42 Armor and War Machine with shoulder cannon. • Dodge the dual missiles! • Activate the buoy’s exploding function and blast the speedboat! I will preface this review by stating that I do not have this set, but that I have seen Iron Man 3. As has been stated many times in the past, the Iron Man sets are not movie accurate. Many fans (including myself) have been off put by the scenarios represented in the Lego sets as they simply do not reflect the movie at all. I would also recommend anyone who has not seen the movie avoid the rest of this review as it will certainly contain some spoilers to the evens in Iron Man 3. Looking over this set, it is clearly evident that the main reasons to purchase this set are the Iron Man MK 42 and War Machine minifigures. Both of these look simply stunning. It would have made sense to play an Iron Patriot minifigure into this theme (as opposed to a video game preorder exclusive) because simple he was in the film whilst War Machine wasn't. The Aldrich Killian minifigure is fairly average, as is the buoy. The speedboat though actually looks sleek and rather well designed. At the end of the day though, the main purpose for buying this set are the Iron Man and War Machine minifigures. First of all, let's have a look at the minifigures. This Iron Man Mk 42 Armor minifigure has excellent detail. This armor is not exclusive to this set, as it can also be found in the 76007 Malibu Mansion Attack set. Personally I would have like for 3 different armor prints to have been used for the three sets. There were plenty on offer in the movie, and it isn't like the sets are movie accurate. That being said, this is an excellent minifigure, though it could have used some arm printing! The next minifigure we look at is the War Machine minifigure. It also has great detail, as well as no arm printing. This minifigure is only available in this set. Finally we have this Aldrich Killian minifigure. He has a double sided head reflecting further development of the character in the movie. I personally think it looks plain and Lego had opportunities to make something better. Part of it came down to trying to avoid spoiling the movie I guess. This minifigure is only available in this set. Lego certainly have mixed this set up with a variety of colours in black, yellow, red and green. Unfortunately, outside of the War Machine and Iron Man minifigures there isn't that much more on offer. It is a good thing they are awesome minifigures though! The set itself is a very simplistic build, almost to the point of being difficult to describe in any real detail. The buoy looks a bit messy but is a very straight forward built that is able to "blow up". The speedboat has a nice, curved finish yet it feels incomplete, probably due to the lack of detail at the rear of the boat. This is because the speedboat has a neat missile setup inside the canopy (not so good for the driver!) that can be used against our Iron heroes when pressing the trigger mechanism at the back. I do not believe these features will improve the sets' popularity in the future at all. I think for the most part they would be cast aside, though the speedboat would get some play. Going by the sold listings, the three minifigures total $22.43, with the current asking prices totalling $24.37. If we consider that the full retail price is $19.99, this is a fantastic return already on a set still easily available. Essentially the set is gaining value after opening the box, which is rather rare for a set still in production. If we compare these sets, the 76006 set is about average in terms of price per piece, giving us a return of around 10c per piece. Considering this is a licensed set, this is rather nice value. Considering the value of the minifigures as well as the remaining pieces, this set certainly does provide value for your dollar! Iron Man 3 is the fifth highest grossing film of all time, returning over $1.2 billion. The 3 Iron Man movies have returned over $2.4 billion theatrically, whilst Iron Man's appearance in The Avengers helped gross over $1.5 billion to be the third highest grossing movie of all time. To say the combination of a Super Heroes theme, Iron Man and Lego, is popular would be an understatement. This set was released in March 2013 and is still currently available. At $19.99 it is cheap, available in many stores and easily accessible to all consumers. As we can see, the box has the standard red colouring of the Marvel line. On the front cover the Iron Man 3 logo is tucked away in the corner with a small picture of the minifigures on the left. I prefer the white text detailing the set over the yellow used on other sets as it makes it easier to read. Iron Man and War Machine feature heavily as they should and the boat isn't exactly tucked away. Killian throwing the dynamite doesn't make a great deal of sense though. 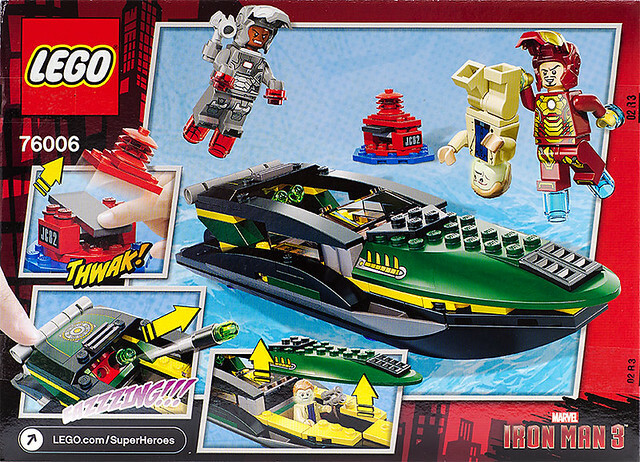 The back shows the comic layout Lego use with this theme; picturing the three playability functions as well as a picture that make Iron Man look like he is stealing Killian's lunch money. The box itself seems rather thin and hollow. Like most Lego smaller sets, you wouldn't stack anything on it or it would crush easily. Thus far as a set, it isn't performing that well and selling below retail. In fact, I expect this set to drop further as stores clear it out cheaper freeing up shelf space for new stock, considering the set has only been available for 5 months. That being said, the cheaper price the better the price per piece ratio. We have already seen earlier how much of the set's value is contained with the minifigures, so between the two sets of data it shows that the set has significant value. Through both the DC and Marvel themes, Lego has spread multiple characters across the sets and chosen to give alternate prints as opposed to sticking with the same minifigure version. This bodes well for the value retention in sets; as it makes characters in that particular form unique. Any future Iron Man sets will more than likely produce different suit variations, and as War Machine was only seen in the first two Iron Man movies before turning into the Iron Patriot, it is unlikely we will see that particular minifigure again. The CAGR of the Super Hero theme is 21.63%, above the current 10.49% Lego average. Whilst the growth is not assured once the set becomes discontinued, it is a good indicator of the theme's popularity and hints of a bright investment future. The problem this set will potentially have is the movie accuracy. As a set it has little to do with the movie at all. I do expect the minifigures value to overcome this, but it may prove to be a potential hindrance in the future. As we can see, whilst the boat design does look kind of neat, it does not display very well. 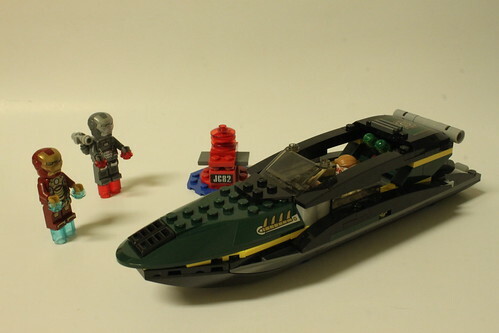 The buoy is simply to flesh out parts and add another section to play with, but the key to this set are the Iron Man and War Machine minifigures. They definitely stand out with their design and will certainly draw the attention of both comic book and Lego fans alike. As Marvel continues to roll out their movies, their characters continue to increase in popularity. The Iron Man franchise continues to pull in the big dollars, while the Avengers has started off with a massive bang. At this stage there are two further Avengers sequels in the pipeline, but nothing on the Iron Man front. Why is this significant? If there are no new Iron Man based sets, then it is unlikely that we will see other Iron Patriot or War Machine minifigures again since neither are in the immediate future plans. We expect to see more Iron Man suits in potential future Avengers sets. This set is not hard to find below the current full retail price and considering the minifigures already return over the full value of the set already, picking this one up really is a no-brainer. It is highly likely this set will be significantly discounted in the future. It contains popular characters in a popular theme which already shows growth. You cannot argue with the minifigures sale prices already, and it gives potential insight into the demand this set can have in the future. It doesn't matter how many copies of this set you have, just make sure you have some on hand when it goes EOL. Don't miss out!